If you are planning a garden this year, you have two options for growing plants. One option is to buy seedlings at a local nursery and transplant them into your garden. The second option is to start your own seeds indoors and grow your own seedlings. Starting seeds indoors is cheaper than buying transplants, however seedlings require a little bit of time and attention. I think it’s fun to watch plants grow from a tiny seed, so if you have time, I recommend starting at least a few seeds indoors. Having a couple of seedlings indoors to grow and care for is also good practice if you’ve never done it before. You can learn a lot from one year to the next, and if next year you want to start more seeds indoors, you’ll have a little bit of experience under your belt. Certain veggies must be started indoors many weeks before the first frost date. These are tomatoes, peppers and eggplant. Starting seeds indoors gets the plant going a lot faster so you can harvest fruits sooner. 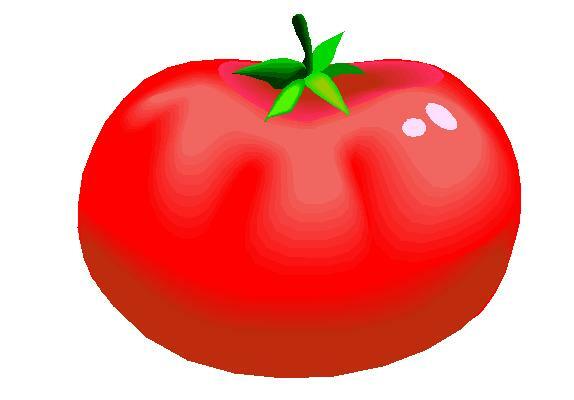 If you direct sowed tomato seeds (which means plant the seeds straight into the ground) you would not get any tomatoes until September or maybe even later. Who wants to wait that long? Starting seeds indoors (or buying transplants) will get you tomatoes in late July. When starting seeds you’re going to need a little pot for each plant you want to grow. The stores sell these little pots called peat pots, which are made out of material that decomposes in the ground. That means you can plant the entire pot into the ground instead of trying to get the little plant out of the pot. I used peat pots my first year of gardening. But last year I came across an idea in Real Simple magazine about making your own homemade seed containers out of yogurt containers. I really liked the idea because it’s a great way to reuse items that you might ordinarily recycle or just throw away. I used them last year to start my seeds and they worked out great! I liked them better than the peat pots. The peat pots got a little too moist and some of my plants got a little mold on them that first year. I did not have that problem when I used my homemade seed containers. To start you need yogurt containers. After enjoying some yogurt, wash out the container and save it. You can also save any other similar type of container like margarine tubs or sour cream tubs. If you don’t eat yogurt or any of those other things, ask your family, friends, neighbors and coworkers to save their containers for you. 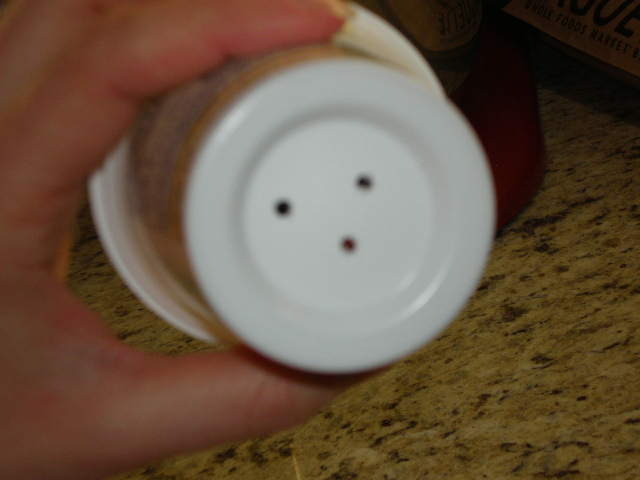 Once you have all the containers you think you need, all you have to do is drill 3 or 4 holes in the bottom of each one. The easiest way is with an electric drill. You only need a small bit. I used 1/8″ bit. Now I feel like I need to give a little disclaimer here. If you have never used an electric drill before, please ask for help from someone who has. Please also wear safety glasses. And please watch your fingers! To show you exactly how easy and fast this is, I enlisted Benzo’s help and made a little video! 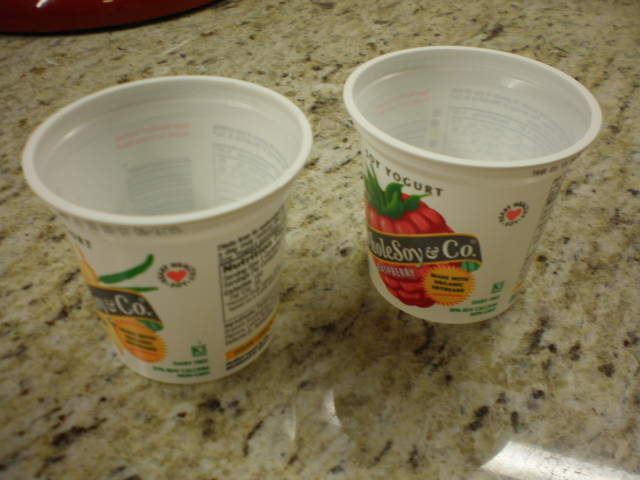 It took 16 seconds to drill 4 holes into the bottom of the yogurt container. Which means that in a little over a minute you can have four of these bad boys done. Notice that I put a cutting board down to protect my counter from any overzealous drilling. 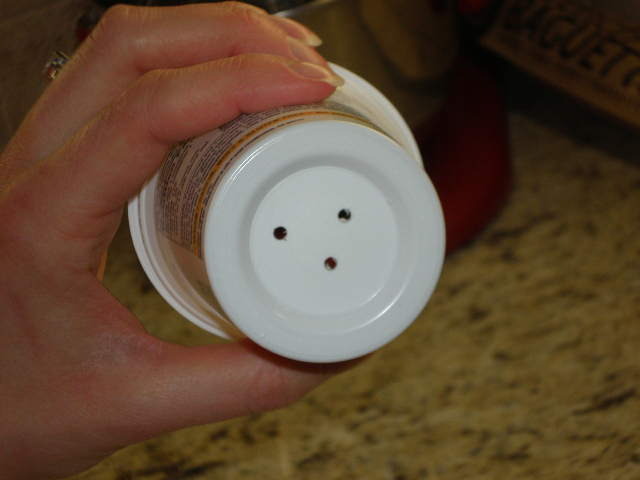 If you do not have an electric drill you can use any method to cut holes in the bottom of the cups. But please be careful! Once you are finished, store these containers with your gardening supplies for a couple more weeks until its time to start seeds! Next Post Kiss Me I’m Natural! Good idea! I have also heard that you can start some seeds in empty egg shells. I haven’t tried it yet, but maybe this is the year. We shall see. Egg shells are good for the soil. I throw them in my compost all the time. You could always put the egg shells in the egg carton/container they came in once its empty to hold them in place!! Cool idea!! Do you know when your frost-free date is? Count back about 8 weeks from your frost-free date and that’s about when you should start. Or 8 weeks back from when you want to put plants in the ground. I did a quick google search and a couple sites say late April. So you could probably go with the first weekend in May like I am. I’m planning to start seeds next weekend, the 5th and 6th.